by MERKS: Day 230, outfit 230. 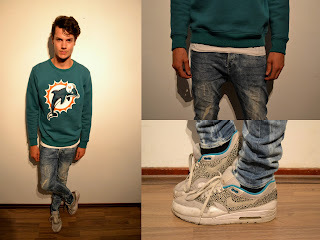 Today, I'm wearing a Miami Dolphins sweatshirt. Great colour and fitting. Combined with a white shirt and a bleached skinny jeans. The shoes for today are my white Nike Air Max 1 Safari.